15 | October | 2008 | Through the seasons before us.. I find it a bit odd when I get an email asking if I’d mind awfully reviewing a book for somebody; but certainly odd in a good way. 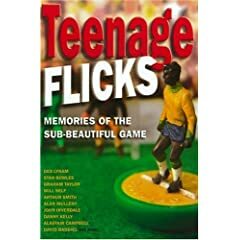 This little compilation by Paul Willetts is an interesting idea, and one that will certainly be relevant to football fans of a certain age. Because it’s all focused around Subbuteo, a word synonymous for me with the sport I love, so I was amazed to discover in the prologue the origins of the the famous trademark. You’ll have to read it to find out! The format of the book is essentially short interviews with well known figures from football and beyond; interspersed with recreations of famous (and not-so-famous) footballing moments using Subbuteo players and accessories (and fear not, Forest feature a couple of times!). Certainly not a deep and meaningful tome, but bloody good fun and nostalgic for those of us who may have dabbled with flicking small plastic men around for hours on end. Some of them even with the accompanying crowd noises thanks to a record! Oddly I never really got into Subbuteo at all as a kid, it always seemed a bit – well, limited. That said, I’m of the age where computers were starting to lure children away from such things, albeit only a ZX Spectrum in my case, and if I wanted some hands-on entertainment (fnar fnar) then it was always Lego for me – however, I do remember my mates who did treat Subbuteo like a religion, and did used to express an interest in the different teams they had etc. So, should you want to read nostalgic whimsies by David Baddiel, Alastair Campbell, Will Self, Graham Taylor, Jeff Stelling and Clough-biographer Duncan Hamilton, then you can get yourself a copy pre-ordered, or you can enter the competition below to win the review copy that publishers Dexter Haven kindly sent me; once I’ve finished reading it, anyway! Perhaps it could be a good Christmas gift for those difficult-to-buy-for male relatives we all have! The question: What did Subbuteo’s creator, Peter Adolph, originally want to call the game he had invented? Please email your entries to nffcblog@yahoo.co.uk, including any amazing Subbuteo masterpieces you feel inclined to create. The deadline is midnight 31st October 2008 – oooh, Hallowe’en – after which point I’ll select the winner at random and get in touch to arrange where to send the book to. I shan’t promise to reply to everyone depending on how many entries there are – so if you don’t hear from me early in November, then you haven’t won! Also, whilst I’m here and posting – Kenny Burns and Garry Birtles inadvertently helped me past a fairly significant milestone; that of my half a millionth visit. Half a million visits (and my hosts cleverly don’t include my own countless visits either!). It makes me feel very gratified that so many of you kindly grace the site with your presence – sincere thanks. I only feel a bit reticent that I’ll have to start writing about present-day Forest again at the weekend!